New Career Programs: Leadership & Info Technology! Cellphone Photography Excursion: Camera Magic! Jewelry and crafts instructor Susan Ryza earned a BFA in Textile Design & Art Education from Rhode Island School of Design, and an MS in Bilingual Education from Long Island University's Brooklyn Campus. 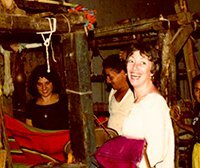 From 1977-1979, she worked with weavers in the Peace Corps in El Salvador, developing new designs and marketing strategies. Between 1979 and 1995, she owned and operated Toucan Hats & Accessories, a wholesale millinery design and manufacturing and handcraft import business. She moved to Santa Monica from New York City in 1990. She and her husband, Steve, have two children. 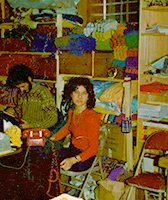 In 2000, Susan started teaching crafts at The Westside Waldorf School in Santa Monica. Since then, she has taught jewelry-making, knitting, crochet, weaving, sewing, needlework, macramé, & basket weaving to both children and adults at Wildfiber, Crossroads School, Michael’s Craft Store, Will Rogers School and Seven Arrows School. Aside from teaching at SMC Community Ed, she also teaches at SMC’s Emeritus College for older adults. Her work has been displayed at Becket Arts Center in Massachusetts and at the Emeritus Gallery in Santa Monica. 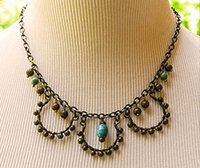 This fall, she is teaching Bead & Jewelry Basics and Creating Chains & Clasps from Wire at Community Ed. What are the rewards and challenges of teaching? Is it different for adults, older adults and children? I love teaching for many different reasons. Above all, I enjoy sharing the knowledge I have with students who are eager to learn. Teaching crafts feels like sharing my favorite hobby with people who are really interested. Because my classes are taken completely by desire and not for credit, all the students who come to my classes are very excited about receiving what I have to share with them. It's also extremely gratifying when students tell me how much making things with their hands adds to their quality of life. I've had many students tell me they were depressed before they took my classes and are now excited about life again because they have crafting to look forward to. That makes me feel like what I'm doing is really worthwhile. The biggest challenge is when students feel negative about their ability to make things or design things. I love helping them overcome their fears. Part of my mission in teaching is to help people feel good about themselves and their abilities. Teaching younger and older adults is surprisingly similar. I have 80- and 90-year old students who are as capable and artistic as any 20-year-old. Teaching children is a little more challenging because you have to deal with discipline issues along with imparting the subject matter. That's not a problem with adults (usually). I only occasionally have to keep a 75-year-old student after class for detention. You mean the craziest, printable thing I've ever done, right? If you ask my parents, it was traveling on my own through Europe for a year when I was 20. This was before the Internet or cell phones existed, so my parents were worried about me every day because they had no idea where I was. I thought they were over-reacting at the time. Now that I have my own children, I completely sympathize with them for what I put them through. 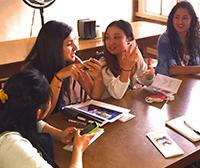 What do you like best about teaching at SMC Community Ed? I love meeting all the different students and interacting with them. I also love how much they enjoy learning to make jewelry. 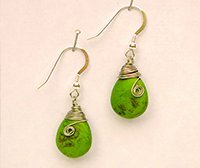 Many times students tell me how much making jewelry has improved their lives. Working with our hands is really satisfying. I also like the scheduling flexibility the administration gives us; and I like working with Alice Meyering, who is a very sweet and helpful person who is very dedicated to building the program. Are there one or two anecdotes you can share about your teaching experiences and/or students? Any surprises? This isn't a specific anecdote, but it's been really interesting to see how differently people learn and how differently they visualize things. Show one person how to put together a chain maille bracelet and they'll say, "This is like a spider web, right?" Another person might say about the same bracelet, "This is like the air holes in a piece of bread." Each person creates different images in their mind to remember how to put something together. Observing how people learn really gives me insight into how their minds work and helps me see what a wide variety of people there are in the world. Another cool thing is to watch people make friends and see people who come from different countries and speak different languages make connections that often lead to long-time friendships. You can read the rest of Ryza's interview here. We’re excited to announce that we are doubling our career training and professional development offerings – all to expand job opportunities and advancement in high-demand, good-paying fields – to our community. Joining our Paralegal Academy and Customer Service Academy, starting in January, will be the Leadership Certificate Program and Cisco Technologies Academy. The Leadership Certificate program offers two tracks – Frontline Manger Certification and Mastering Management Skills Certification. Each track consists of six modules that span topics such as “Dealing with Difficult People” and “Directing Change in the Workplace”. Students in The Cisco Technologies Academy can gain new skills in-demand in the Information Technology profession. The program will offer training to professionals seeking to advance their skills as well as courses for those seeking entry-level job skills. All of these career training and professional development programs will come under a new umbrella, SMC Extension. The new name will help identify these programs as distinct. I’m planning to host an SMC Extension launch event and create a professional development advisory board to help energize this new program. Stay tuned for details! In the meantime, we hope you’ll join us this fall. 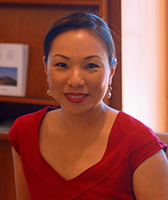 Registration is easy by calling (310) 434-3400, going to http://commed.smc.edu, or emailing commed@smc.edu. As we are enjoying our usual sunny weather here in SoCal, I am reminded that the fall semester is about to start at the end of this month! Our fall class schedules were mailed out in late July, but if you didn’t get yours, feel free to email commed@smc.edu to request a copy. When I started the crazy idea of hosting our first Photo Contest for the cover of our Fall Class Schedule, I never imagined that it would continue to create buzz months after the winning image was selected. 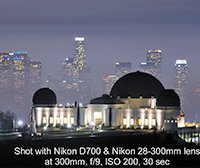 Dean Reyes’ “Observatory at Night” is an amazing shot that captured the Griffith Observatory and Downtown L.A. in a fantastical, dreamy haze, but it appears that some believe it to be too fantastical. Some speculated it had to have been Photoshopped. It was quite the learning experience for me to take that shot so if anybody else can learn from my experience, I'm more than willing to share my little story behind it. And for me it was quite an adventure because after sundown I heard animals howling (most likely coyotes) and I couldn’t wait to finish taking my photo to run back to the observatory parking lot. Back then I thought it was crazy to stay out there alone in the dark just to get the photos but we know now it was definitely worth it! I had hiked the Griffith Park Hollywood trail dozens of times during the day and have always wanted to take a picture at that area at night. 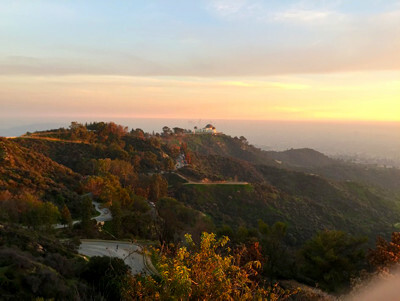 I thought the Griffith Observatory photo would be cool because it aligns with the tall downtown LA buildings in the background at a particular spot on the trail, which is a 20-minute hike from the parking lot. (See photo). 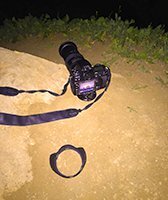 When Larry Jones, our instructor, assigned our class to take night photos, I thought that would be the perfect and apply what I learned from class. I hiked to the spot late in the afternoon and waited for the sun to go down. I set up my camera on a tripod and I was planning for a long exposure shot. When the sun went down, I took several photos and noticed that the pictures that I took were blurry. I had learned in Jones’ class that for long exposure shots, it's crucial that the camera does not move. So I put the camera on delay timer mode to give the camera time to stabilize a bit on the tripod after I press the shutter button. Meanwhile, the wind was blowing hard since I was so high up the mountain. Good thing I remembered another tip I learned from class. Jones shared with us that when he takes his long exposure shots, he hovers over the camera with his jacket to block the wind blowing on it and make sure that the wind does not rock the tripod. I tried it and it worked but there was still a slight blur on the pictures so I think the camera was still moving. The other problem, I realized, was that since I was shooting at a long focal length (my lens was zoomed to the max at 300mm and protrudes out of the camera a lot), the camera/lens weight was unbalanced on my flimsy tripod so it moved slightly when the camera shutter opened and closed (the 'click' sounds the camera makes during the shot) and causes the blur. I lied down on the ground, framed my shot, hovered over the camera with my sweater to block the wind, put the delay timer on and took the picture. Eureka, it worked! I thought I'd take a couple more shots with different camera settings before I ran back to the parking lot. As I mentioned before, I was doing all this alone in the dark on an unlit trail with animals howling around me. And then, something else happened: The observatory just suddenly went dark – most of the lights illuminating the building were turned off. I found out later that the observatory had a special star-viewing event that night. A couple of powerful telescopes had been set up on the lawn area, and in order to optimize the viewing experience, the lights had to be turned off. I was really lucky that I was able to troubleshoot and take the observatory photo I've always wanted just in time before they flipped off the light switch! Lessons learned: 1. 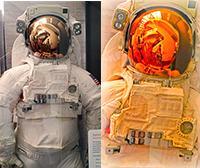 Take Larry Jones' photo class, 2. Work with what you got and your surroundings, 3. Try to plan ahead for any obstacles (get to the site early before they turn off the lights), and 4. Bring a friend along to your photo shoots so you'll have a lookout just in case there are wild animals around! Like many people, I’m amazed by the quality of photos that can be taken on cell phones. Apple has even capitalized on its iPhone photography capability by running huge billboard ads with striking images (presumably taken by ordinary citizens) and the simple but arresting caption: Taken on an iPhone. An iPhone 6 owner myself, I, too, have been pleased with some of the pictures I snap on my mobile device. I don’t bother with a camera any more; the iPhone is just fine, thank you very much. However, I’m not completely satisfied with my photography skills, and so I signed up for the “Tourist for a Day: Cellphone Photography” class taught by Brian Leng. It was a rare rainy day in July, so Brian canceled the class (it’s rescheduled for Sept. 19). But because some of us did not get the cancellation email, we showed up and he gave us some tips and set us loose to shoot around Olvera Street and other locales around Union Station in downtown L.A. Even before we met up with Brian, he told us to download the BeFunky app on our phones, a terrific photo editor/image manipulator application that is great fun to play around with. Aside from all kinds of editing functions (cropping, fill light, softening, exposure, etc. ), the app allows you to do touch ups, create effects, add text, create collages and more. • Buy a portable back-up charger, particularly if you plan to spend a whole day taking photos. They’re available online and at many retail outlets, including Costco. • Each phone is different, so experiment, try different things. Take an image with flash and without – and compare the results. Cameras will always expose for the lightest part of the picture, so be aware of shooting into objects or people that are backlit. • Holding your phone steadily is important, so if your camera has voice command, use it. Or you can use a timer, or put your elbows down on a surface, or even steady yourself against a wall. Any of these methods can create clearer, better images. Brian did not give us direct advice on which phone is best for images, but as much of an Apple loyalist I am – and as impressive as Apple’s iPhone images on billboards are – I’ve been struck by the quality of photos taken on Androids. Honestly, I think they are better than iPhone shots. And Brian showed me his Samsung, whose camera comes with a whole bunch of controls not found on my iPhone 6 – including Voice Command, Exposure, ISO, White Balance and Metering Modes. Mind you, I’m not ready to switch to an Android, but for those of you contemplating purchasing a new phone, it’s something you might consider. I’d highly recommend taking the class in September, not only to sharpen your photographic skills, but also to discover – or rediscover – some wonderful downtown sites.